• state the conditions which require that two alternators be paralleled. • describe the use of synchronizing lamps in the three dark method and the two bright, one dark method of synchronizing alternators. • demonstrate the procedure for paralleling two three-phase alternators. • state the effect of changes in field excitation and speed on the division of load between paralleled alternators. Alternators are paralleled for the same reasons that make it necessary to parallel dc generators. Two alternators are paralleled whenever the power demand of the load circuit's greater than the power output of a single alternator. When dc generators are paralleled, it's necessary to match the output voltage and electrical polarity of the machines with the voltage and polarity of the line. The same matching is required when alternators are paralleled. However, the matching of alternator polarity to that of the line presents problems not encountered when matching dc generator and line polarities. The output voltage of an alternator is continuously changing in both magnitude and polarity at a definite frequency. Thus, when two alternators are paralleled, not only must the rate of the rise and fall of voltage in both alternators be equal, but the rise and fall of voltage in one machine must be exactly in step with the rise and fall of voltage in the other machine. When two alternators are in step, they are said to be in synchronism. Alternators cannot be paralleled until their voltages, frequencies, and instantaneous polarities are exactly equal. ill. 1 shows a comparison of the voltage curves of one of the phases of two three-phase generators operating independently but at different speeds. The voltage curves must be in synchronism before paralleling machines. The output voltage of an alternator can be controlled by varying the strength of the direct current in the field circuit of the alternator. A field rheostat can be used to vary the dc current. Since the frequency of an alternator varies directly with speed changes, it's necessary to be able to control the speed of at least one alternator in an installation containing two machines. To synchronize AC generators, several important factors must be checked. 1. The phase rotation of both generator systems must be the same. Check this with lights as described later or use a phase rotation meter to determine ABC or ACB rotation. 2. The AC voltages of both generators should be equal. In practice the voltage of the on-coming generator is usually 1-2 volts higher than that of the other operating generator. 3. The frequencies of the on-coming generators must match when synchronized. In practice the frequency of the on-coming generator is 1-2 hertz higher than that of the on-line generator. This can be observed with lights or by using a synchroscope. The speed and output voltage of the on-coming generator are slightly higher to pre vent it from becoming a load to the system when it's connected. Two methods of synchronization using lights are described below. 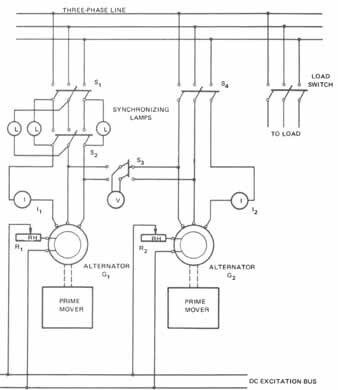 The following describes the method of synchronizing two alternators using the three-dark method. 1. The three lamps will light and go out in unison at a rate which depends on the difference in frequency between the two alternators. 2. The three lamps will light and go out at a rate which depends on the difference in frequency between the two machines, but not in unison. In this case, the machines are not connected in the proper phase sequence and are said to be out of phase. To correct this, it's necessary to interchange any two leads to alternator G1. The machines are not paralleled until all lamps light and go out in unison. The lamp method is shown for greater simplicity of operation. By making slight adjustments in the speed of alternator G1 the frequency of the machines can be equalized so that the synchronizing lamps will light and go out at the lowest possible rate. When the three lamps are out, the instantaneous electrical polarity of the three leads from G1 is the same as that of G2 At this instant, the voltage of G1 is equal to and in phase with that of G2 Now the paralleling switch can be closed so that both alternators supply power to the load. The two alternators are in synchronism, according to the three dark method. The three dark method has certain disadvantages and is seldom used. A large voltage may be present across an incandescent lamp even though it's dark (burned out). As a result, it's possible to close the paralleling connection while there is still a large voltage and phase difference between the machines. For small capacity machines operating at low speed, the phase difference may not affect the operation of the machines. However, when large capacity units having low armature reactance operate at high speed, a considerable amount of damage may result if there is a large phase difference and an attempt is made to parallel the units. Another method of synchronizing alternators is the two bright, one dark method. In this method, any two connections from the synchronizing lamps are crossed after the alternators are connected and tested for the proper phase rotation. (The alternators are tested by the three dark method.) ill. 3A shows the connections for establishing the proper phase rotation by the three dark method. ill. 3B shows the lamp connections required to synchronize the alternator by the two bright, one dark method. When the alternators are synchronized, lamps 1 and 2 are bright and lamp 3 is dark. Since two of the lamps are becoming brighter as one is dimming, it's easier to determine the moment when the paralleling switch can be closed. Furthermore, by observing the sequence of lamp brightness, it's possible to tell whether the speed of the alternator being synchronized is too slow or too fast. A synchroscope is recommended for synchronizing two alternators since it shows very accurately the exact instant of synchronism (ill. 4). The pointer rotates clock wise when an alternator is running fast and counterclockwise when an alternator is running slow. When the pointer is stationary, pointing upward, the alternators are synchronized. The synchroscope is connected across one phase only. For this reason it cannot be used safely until the alternators have been tested and connected together for the proper phase rotation. 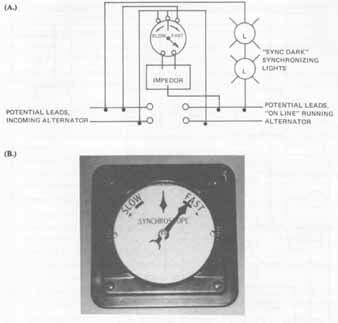 Synchronizing lamps or other means must be used to determine the phase rotation. 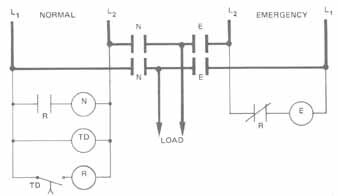 In commercial applications, the alternator connections to a three-phase bus through a paralleling switch are permanent. This means that tests for phase rotation are not necessary. As a result, a synchroscope is the only instrument required to bring the machines into synchronization and thus parallel them; however, a set of lights is often used as a double-check system. In industrial applications, alternators are driven by various types of prime movers such as steam turbines, water turbines, and internal combustion engines. For applications on ships, alternators often are driven by dc motors. Regardless of how alternators are driven, speed variation is a factor in paralleling the machines. Thus, the electrician should have knowledge of speed governors and other speed regulating devices. This text, how ever, does not detail the operation of these mechanical devices. Since apprentices are likely to be required to parallel alternators driven by dc motors sometime in their instruction, the following steps outline the procedure for paralleling these machines. ill. 5 illustrates a typical circuit for paralleling two three-phase alternators. 1. Set the field rheostat R2 of alternator G2 to the maximum resistance position. 2. Knowing the number of field poles in alternator G2 determine the speed required to generate the desired frequency. 3. Energize the prime mover to bring alternator G2 up to the required speed. 4. Set Switch S to read the ac voltage across one phase of G2 Adjust field rheostat R2 until the output voltage is equal to the rated voltage of the load circuit. 5. Close the load switch and switch S4 to feed the load circuit. Readjust the speed of the prime mover to maintain the predetermined speed required for the desired frequency. 6. Readjust R2 to obtain the rated ac voltage of the load circuit. 7. Energize the prime mover to drive the second alternator, G1 Adjust the speed of the alternator to the approximate value required to match the frequencies of the alternators. 8. Set switch S3 to measure the ac voltage across one phase of G1. Adjust field rheostat R1 until the ac voltage is equal at either position of switch S3. The voltage output of both alternators is now equal. With paralleling switch S2 open, close switch S1. a. The three lamps will brighten and then dim in unison. b. Two lamps will brighten in unison as the remaining lamp dims. Then the two bright lamps will dim as the dark lamp brightens. 10. If the lamps respond as in 9a, the alternators are connected for the proper phase rotation. The operator then may proceed to the next step in synchronizing the alternators. 11. If the lamps respond as in 9b, the alternators are not in the proper phase rotation. To correct the condition, interchange any two alternator leads at the terminals of switch S2. All three lamps should dim together and brighten together. No attempt to parallel the alternators should be made until the lamps respond in this manner. 12. The three lamp sets will flicker (dim and brighten) at a rate equal to the frequency difference between the two alternators. Adjust the speed control of prime mover M1 to make the lamps flicker at the lowest possible rate. 13. Interchange two lamp set leads (not alternator leads) at the terminals of switch S2 so that the alternators can be synchronized using the two bright, one dark method. 14. Again adjust the field rheostat of alternator G1 until both alternators have the same output voltage as measured at either position of the voltmeter switch S3. 15. With one hand on switch S2 watch the lamps. Close the switch at the exact instant that two lamps are at their brightest and the other lamp is out. This operation shunts out the synchronizing lamps and parallels the alternators. 16. Ammeters I1 and I2 indicate the amount of load current carried by each alternator. If the load circuit has a unity power factor, then the sum of the ammeter readings should equal the reading of the ammeter in the load circuit. 17. Note that a change in the field excitation of either alternator does not appreciably change the amount of current supplied to the system. Such a change in field excitation does, however, affect the power factor of the specific alternator. The field rheostat of each machine should be adjusted to the highest power factor as indicated by the lowest value of current from the individual machine. Increasing or decreasing the mechanical power to either alternator will increase or decrease the load current of that machine. As a result, the division of the load between the alternators can be changed by slight changes in the alternator speed. Two alternators operating in parallel must have the same frequency and the same terminal voltage. In addition, the prime movers of the parallel alternators must have similar drooping speed load characteristics. For steam-, diesel-, water-, or gas-driven prime movers, the speed load characteristic depends on adjustments of a mechanical speed control governor. These adjustments determine the division of load for two alternators operating in parallel. For this reason, the kilowatt load delivered by two alternators in parallel cannot be divided in any desired proportion by varying the dc field excitation of either machine. Two alternators properly connected in parallel will operate in stable equilibrium. If one alternator attempts to pull out of synchronism, a current is created which circulates between both alternators. This current increases the speed of the lagging machine and retards the leading machine thus preventing the machines from pulling out of synchronism. If, for any reason, one machine is allowed to slow to a point where the other machine is taking all the electrical load, the zero load generator then goes to a negative value or “reverse power.” This generator has now become a motor. This situation is of particular concern where the machine’s protective scheme has not been designed to operate properly in the motoring situation. In such conditions reverse-current relays are usually employed to trip the generator on detection of reverse power flow. If a generator loses prime mover power, it acts as a motor with a dc field on the rotor. The dc field will cause the rotor to try and follow the ac field in the same direction as before. If the mechanical drag on the rotor is heavy, it will fall behind and “slip poles,” inducing a large voltage into the rotor; this can cause insulation breakdown of the windings, flashover at the brushes, and violent shaking of the generator mountings. If a generator loses dc excitation to the rotor it won't generate, but the prime mover power will still turn the rotor. Now the generator acts as a motor running at no load. In many cases the parallel operation of alternators is essential to provide needed power and to maintain electrical power during peak loads or when removing an alternator from service for maintenance. The requirements for paralleling are: (1) the phase rotation of the generated voltage must be the same, (2) the voltage at the paralleling point must be the same, and (3) the frequencies of the generators must match. Lamps and synchroscopes are often used to aid in the paralleling procedure. If a generator loses output power, it must be removed from the electrical power system or serious consequences could result. A. Select the correct answer for each of the following statements. a. so that one isn't overworked. b. because of a rising load demand. c. to ease the workload. d. because of the declining load demand. d. voltages, frequencies, and instantaneous polarities. a. adjusting the prime mover. b. adjusting the direct current of the field circuit. a. the machines are not polarized. b. the phase sequences are wrong. c. the paralleling switch should be closed. d. the frequencies differ by a large amount. a. the lamps may burn out. b. an undetected voltage may be present at the lamps. c. the light is more difficult to see. d. an undetected current may be present through the lamps. b. the three dark method. c. the three light method. d. the two bright, one dark method. a. alternators are ready to parallel. b. alternator being synchronized is too slow. c. alternator being synchronized is too fast. d. machines have not been polarized. a. alternators are in synchronism. b. alternators are not in synchronism. c. incoming alternator frequency is too slow. d. incoming alternator frequency is too fast. b. speed of the prime movers. c. power factor of the load. B. Insert the word or phrase to complete each of the following statements. 1. To operate satisfactorily in parallel, two alternators must have the same___, the same frequency, and the same___. 2. Two alternators are to be connected in parallel. The best instrument to use for synchronizing them is a(an)_____. 3. An alternator is connected to a live three-phase bus. Using the three dark method, a lamp is connected in series with each lead. The lamps brighten and dim in unison. This proves that the alternators have the proper _______________________ rotation. 6. The output voltage of alternators operating in parallel is equalized by adjusting their___________. 7. The load on an alternator operating in parallel with another alternator may be increased by decreasing the spring tension of its speed ___________. 8. The division of load between two alternators operating in parallel can be changed by adjusting the____________. 9. Two alternators, A and B, are being synchronized for parallel operation. Alternator A is operating at a frequency of 60 hertz. The synchronizing lamps are flickering twice a second. The frequency of alternator B is________ hertz or _________ hertz. 10. Synchronizing lamps and a synchroscope are being used to parallel two alternators. Just before the moment the alternators are paralleled, there is no visible light from the lamps but the synchroscope is rotating slowly. In this case, the _________ method should be used to indicate when the paralleling switches should be thrown because_______.